The Outwell range of Cooking and Tableware accessories completes our one-stop shop commitment to family campers by offering a comprehensive range of products that complements our unique range for kitchen and table on campsites, on picnics and at barbecues in the garden.Outdoor chefs benefit from a Utensil set, Kitchen knives, with a Cutlery set to add practical style to the dining table. 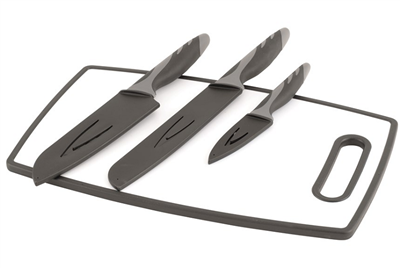 Outdoor chefs will love the professional feel of the Outwell Caldas knife and cutting board set. It comes with a bread knife, paring knife for peeling, santoku knife for chopping, dicing and mincing, plus a handy chopping board. All knives have a non-stick coating for easy cleaning, non-slip handles and a blade cover.